We’d love your help. Let us know what’s wrong with this preview of Cat With a Clue by Laurie Cass. Early one morning while shelving books in the library, Minnie stumbles upon a dead body. Authorities identify the woman as an out-of-towner visiting Chilson for her great- The national bestselling author of Pouncing on Murder returns as librarian Minnie Hamilton and her rescue cat Eddie discover there’s a true crime story unraveling in their own nonfiction section. . . .
To ask other readers questions about Cat With a Clue, please sign up. Lori Eddie stayed with Sheriff Richardson for a short period of time, and took to the lady sheriff. A real page turner, CAT WITH A CLUE will leaving you purring for more! I can’t believe we’re already up to book five in this fan-cat-stic series. It feels like yesterday that I picked up the first book, LENDING A PAW, and fell in love with Minnie, Eddie, and their wonderful bookmobile. This fifth book in the Bookmobile Cat Mysteries is the second best book in this series (I’ll always have a soft spot for the first book). Author Laurie Cass continues to up her game with strong, more intricate myst A real page turner, CAT WITH A CLUE will leaving you purring for more! This fifth book in the Bookmobile Cat Mysteries is the second best book in this series (I’ll always have a soft spot for the first book). Author Laurie Cass continues to up her game with strong, more intricate mysteries. CAT WITH A CLUE kept me guessing the entire way through, and I had no idea of the who or the why until all was revealed. If you’re looking for a book with mystery, excitement, and fun . . . oh, and a sassy feline, look no further! Check out the back of the book where you’ll find a sneak peek of the newest book coming up in this fun series! RIP Eddie – The “real” Eddie passed away in March 18, 2016. My condolences to author Laurie Cass on the loss of her sweet furbaby. Eddie will live on forever in our hearts and on the pages of this series. I am a big fan of this author and of this series. Cozy mysteries in which cats play a large role are a huge favorite of mine, and this one is very well-written. This time around, Minnie and Eddie are involved in solving a murder which takes place right in the library, as well as a string of break-ins around town. Ms. Cass keeps the reader guessing right up to the final reveal as to the identity of the killer, and keeps building the suspense all the way through the story. I love to see the human c I am a big fan of this author and of this series. Cozy mysteries in which cats play a large role are a huge favorite of mine, and this one is very well-written. I love to see the human characters growing and developing as the series continues, and to see Eddie continue to be the same sassy fellow he has always been. I was saddened to learn that the real-life Eddie passed away on March 18, 2016. Having lost my own furbabies in the past, my heart goes out to Ms. Cass and her family on their loss. Great series, especially if you love cozy's and cats. Eddie is great Mrrrrr. ‘A Cat with a Clue’ has wins four paws and a tail up for a five star rating from me! It is fifth in ‘A Bookmobile Cat Mystery’ series, which is one of the handful of cat cozy mysteries that I really enjoy, and I look forward to each new novel in the series. The combination of a special cat, a library, and a setting in my home state makes it impossible to miss. Eddie is the bookmobile cat in Tonedagana County, Michigan in northwest Lower Peninsula. Minnie is the Assistant Director of the library and was also in charge of the bookmobile program. She explores new routes when requested to add a stop, and drives it 2 to 3 days a week with a library volunteer through sunshine or snow. Eddie had been a stowaway the first time he rode it, and a smuggled kitty the next time he rode at the request of a young girl undergoing cancer treatments. Since then, he is a regular passenger; the bookmobile patrons adore this precocious tabby. In the meantime, Minnie’s favorite (and only!) Aunt Frances has started her summer business of running a B & B. She rents to singles who plan to stay for the summer if she might successfully play matchmaker with them. This summer, however, her mind – and heart – are elsewhere, on the friendly widower who moved in across the street from her, Otto. After more than two decades of being a widow, Frances’ heart has met its match in him. Early one morning Minnie was shelving books before the staff arrived, and literally stumbled over the body of a dead woman in the nonfiction shelves. The woman was the niece of an elderly woman who had recently passed away. The niece was in town for her great aunt’s funeral – but how had she gotten into a locked library – and how did the killer get out? There was no sign that anyone had broken in, and all the doors were locked when Minnie arrived. Once more, Minnie and Eddie are on the trail of a killer without really meaning to be. Minnie’s new boyfriend, Ash, is a deputy with the county sheriff’s office who wants her to be safe and not take the kind of risks as she had in the past. This time, however, the stakes are higher than ever for Minnie when the bad guy/ gal finds out she is hot on the trail. Minnie is an independent woman in many ways, living on a small houseboat during the summer and with Aunt Frances in the winter when the B & B is closed. She has clearly learned much from her aunt, who was widowed at a young age and supporting herself since in a town where winters can be harsh. Neither are shrinking violets! The characters complement each other, including the library staff, Minnie’s best friend Kristen, and Ash, who takes part of his morning run with her. Other characters contribute to solving the mystery as they bounce ideas off of each other. Whether the characters are long-term to the series or short-term to the novel, each is designed with care and given that bit of humanity that brings them to life. Let’s not forget Eddie! He has a unique catsonality that, while the cats I have loved have some of his traits, not one of them has quite all the personality plus Eddie does. And yes, I do think he understood everything Minnie said to him! The plot was flawlessly executed, well-detailed, with plot twists that changed the course of questions that Minnie asked of people. The author has a gift for keeping several balls in the air at once, between the break-ins around town, the family of the murder victim, Minnie’s life with Eddie and her friends, and solving the murder itself. As the novel proceeded, I selected and discarded several suspects. The actual murderer, and the terrible threats made, were the stuff that nightmares are made of for those of us who love our felines. All the situations were resolved beautifully, and now…I eagerly await the next one. I heartily recommend ‘Cat with a Clue’ to cozy mystery readers who love cats, books/ libraries, and mysteries that keep the reader guessing through the very end. The unique flair this one has of the bookmobile with the bookmobile cat adds to the amazing series the author blesses us with, a series I hope to see for a long time to come. The 5th in the continuing adventures of Minnie and Eddie and the bookmobile. Books, a cat, a librarian and a mystery. I like. This was a clever quick read. I adore the cat, Eddie, and the way he listens to Minnie and responds to what she says. Of course he understands and yes, he has an opinion on what happens. I'm glad Minnie likes Ash. I wonder if the very interesting character, Dana Coburn, will be in future books. I found it a bit of a slow read and there was not any real action until page 361 of 399 pages and then for only about seventeen pages. The last twenty one pages were almost not necessary; except to find ou This was a clever quick read. I adore the cat, Eddie, and the way he listens to Minnie and responds to what she says. Of course he understands and yes, he has an opinion on what happens. This was another fun trip to Chilson to see what Minnie and Eddie are up to this time. This series makes me really wish for a Bookmobile in my town. An enjoyable cozy and I can't wait to read the next installment! Cat with a Clue by Laurie Cass is the fifth in A Bookmobile Cats Mystery series. Minnie Hamilton is the interim Director of the Chilson Public Library since the director left for a better position. She is still driving the bookmobile as well. Minnie arrives two hours early for work to get ahead and starts by shelving books. Minnie is naturally reading while walking to the shelves (and not watching where she is going) and stumbles. She looks down to find the body of a woman with a knife sticking Cat with a Clue by Laurie Cass is the fifth in A Bookmobile Cats Mystery series. Minnie Hamilton is the interim Director of the Chilson Public Library since the director left for a better position. She is still driving the bookmobile as well. Minnie arrives two hours early for work to get ahead and starts by shelving books. Minnie is naturally reading while walking to the shelves (and not watching where she is going) and stumbles. She looks down to find the body of a woman with a knife sticking out of her. Minnie immediately calls 911 from the reference department phone. The Chilson Police Department Chief of Police is happy to turn the case over to Detective Inwood and Ash Wolverson (who is training to be a detective). Minnie is happy to see Ash and get a little comfort (he is her boyfriend which is mentioned frequently throughout the novel). The woman is Andrea Vennard who is related to Talia Dekeyser who just passed away. Why was Andrea in the library after hours? Minnie knows this will cast a pall over the library and make patrons (as well as staff) a little afraid of her beloved library. Minnie cannot let this happen and is determined to find the killer. Then the Friends of the Library sale room is broken into and disturbed. Nothing seems to have been taken, but it is hard to tell (they do not keep records). After the local antique store is broken into, Minnie begins to notice the pattern. The killer is looking for (spoiler)! Minnie just has to find out what (spoiler) they are looking for and find it before the culprit. The staff at the library is trying to get Minnie to apply to be the permanent director of the library. But Minnie is not sure she wants the responsibility full-time. After the board interviews each candidate, the pressure is increased. Will Minnie apply for the position? Cat with a Clue is a cute story. Minnie was a little too spacey (instead of quirky) in this novel (more than normal). She seemed to always be walking, wandering, or riding her bike and not paying attention. Her employees even commented that she seemed to have checked out at work. The book is nicely written and easy to read. But I found more of the book devoted to Minnie talking to her cat, Eddie, than to the mystery. The mystery was not complicated (I kept hoping for a curveball) and I knew who did it as soon as the character was introduced. I give Cat with a Clue 3 out of 5 stars (it was okay). I have read all the books in the series and Cat with a Clue is my least favorite. I just expected more. While Cat with a Clue is the fifth book in A Bookmobile Cats Mystery series, it can be read alone. The author updates the reader on Minnie’s background (how she came to the town, opened bookmobile, etc.). There is some romance in the book. Aunt Frances being squired about by Otis Bingham and Minnie dating Ash (we get details on their dates—kayaking, water skiing, etc.). Will I read the next book in this series? Probably. I hope that there will be character development and a more complex mystery. We need more development of Minnie’s character. It is time for her to stop daydreaming (she can still daydream some) and decide what she wants (her work goals and maybe a permanent home). I received a copy of this book in exchange for my honest opinion. And my honest opinion is that I really enjoyed this book. I have not read any of this series before but I wasn't lost at all. The author did a very good job of introducing the characters in this book without being tedious. I feel that I can go back and read the other books in the series and not feel too out of place. The mystery of who committed the murder and why was nicely laid out and kept me guessing, although there was a hint I received a copy of this book in exchange for my honest opinion. And my honest opinion is that I really enjoyed this book. I have not read any of this series before but I wasn't lost at all. The author did a very good job of introducing the characters in this book without being tedious. I feel that I can go back and read the other books in the series and not feel too out of place. The mystery of who committed the murder and why was nicely laid out and kept me guessing, although there was a hint about the murderer that made that person a bit of a suspect. I do think Minnie needs to pay more attention to the clues Eddie gives her. He is one smart kitty, although I was surprised he wasn't more distrustful of the bad guy. I actually would give this book 4.5 out of 5 stars, but Goodreads doesn't let me do that. 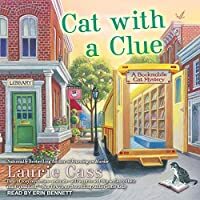 "Cat with a Clue" is the 5th installment of the Bookmobile Cat mysteries by Laurie Cass, and I have to say that I think this one is my favorite in the series so far. The basic synopsis is that strange things are happening in Chilson and in its library. We start off with our heroine, Minnie, finding a dead body in the library and then there are a series of strange break-ins, both at the library and at other I actually would give this book 4.5 out of 5 stars, but Goodreads doesn't let me do that. The basic synopsis is that strange things are happening in Chilson and in its library. We start off with our heroine, Minnie, finding a dead body in the library and then there are a series of strange break-ins, both at the library and at other places around town. It's up to Minnie to help the Sheriff's Department to figure out who's behind all this crime. Well, okay, technically it's up to the Sheriff's office alone, but Minnie thinks it's her job too. I thoroughly enjoy the characters in this series for the most part. They're complex, well-developed and realistic. Minnie, like the rest of us, has trials just dealing with the stress of life sometimes (and don't we all!). Since the two characters I didn't really like left the series in the 4th book, including Minnie's long-distance boyfriend, this book was even more fun for me to read! Minnie's new love interest looks promising as well. Laurie Cass has a very fluid writing style. The story line flows easily from section to section. The transitions of scenes are nearly flawless and I've never felt that the story line drags on and on. It moves at a steady pace throughout the whole book. I will admit that I'm slightly biased on the descriptions of the settings, since it takes place in one of my favorite parts of Michigan. It's a small town set on a small lake in the northwest portion of the Lower Peninsula, one of those places that Michiganders tend to refer to as "Up North". I love reading all the descriptions of the scenery and the places in the book since I'm familiar with the area. I feel like the descriptions aren't too wordy (which is something I really don't like), but as I said, I'm a bit biased on that front. The only reason this book does not receive five stars is because it didn't have a huge "wow" factor for me or an emotional hook for me, which is part of my criteria for a 5 star book. It is still a wonderful cozy mystery and I highly recommend it and the rest of this series! Disclaimer: I received an ARC of this book in exchange for my honest review. As an avid reader since before I started school (Grandma was a teacher...taught me to read when I was four), I was always excited to see the bookmobile. When I saw this series was coming, I looked forward to reading the first installment. Including Eddie the "bookmobie cat" was the cherry on top! I've enjoyed the previous books in this series, and "Cat with a Clue" did not disappoint! Minnie Hamilton is interim library di Disclaimer: I received an ARC of this book in exchange for my honest review. Minnie Hamilton is interim library director after the earlier-than-expected departure of the library director. Stephen had told Minnie he was grooming her to be her replacement and she's not sure she's ready. Her staff fears what a "newbie" would do and they are incessant in their pleas for her to apply. She's not sure, but some of the candidates make her think seriously about it...but what about the bookmobile? It's a normal day when Minnie arrives to ready the library for the day...until she finds a body. Soon the building is closed to the public as Detective Inwood and Deputy Wolverson begin their investigation. Who is the mystery woman? Why was she in the library? More important in Minnie's thoughts...Will people fear coming to the library after a murder occurred there? Then the bookmobile and used book sales room are vandalized. Yes, Minnie is on the case! While investigating, she meets a delightful new character, a very bright child named Dana. I look forward to reading more about Minnie's interaction with Dana. As old Chilson family ties are discovered, Minnie's list of suspects grows. Are the cases of vandalism connected to the murder? Is it a case of someone needing money? All the usual characters are here...Aunt Frances (who has some surprises of her own), Kristen, Rafe, and more, including (gulp) Minnie meeting Ash's mother. Add in a hilarious scene connected with Ash's attempts to "broaden Minnie's activity horizons" and it's a most enjoyable read! 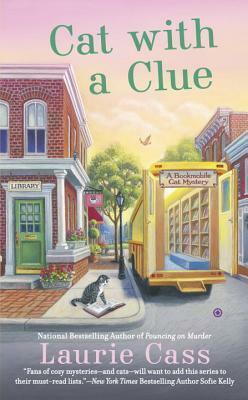 Cat with a Clue is the 5th installment in the Bookmobile Cat Mystery series. Minerva "Minnie" Hamilton is the assistant director of the Chilson District Library in northern Michigan and drives the Bookmobile throughout the county delivering books to those that can't get to the main library. Minnie is stretched thin because in addition to her regular duties she is also acting as the interim director of the library until the board finds someone to fill the position left vacant by Stephen Rangel. T Cat with a Clue is the 5th installment in the Bookmobile Cat Mystery series. Minerva "Minnie" Hamilton is the assistant director of the Chilson District Library in northern Michigan and drives the Bookmobile throughout the county delivering books to those that can't get to the main library. Minnie is stretched thin because in addition to her regular duties she is also acting as the interim director of the library until the board finds someone to fill the position left vacant by Stephen Rangel. The last thing she needs is to stumble over a dead body between the shelves and Minnie soon finds herself caught up in the murder investigation which seems to center around a rare book about Wildflowers. A fun, fast paced storyline full of returning characters will leave you kneading for more. Eddie, Minnie's faithful sidekick and tabby cat continues to steal the spotlight with his antics and "conversations". Ash Wolverson Sheriff's Detective, is Minnie's new love interest and when the duo isn't investigating, Ash is getting her to try new sports - her foray into waterskiing will have you laughing out loud. Minnie's best friends Kristen Jurek and Rafe Niswander have their hands full with her restaurant being featured on TV as a top destination and his house still in the midst of renovation. This installment introduces a delightful new character, Dana. A very smart little girl whose phobias have kept her from the going out in public, I'm hoping that Minnie and Eddie will draw her out of her shell in future stories. Plus, there's an exciting new development in Aunt Francis' life that I think will open up new doors in Minnie's personal life. Check out my other reviews, discussions and link ups at Fantasy of the Silver Dragon. I received this book for free from Obsidian in exchange for an honest review. This does not affect my opinion of the book or the content of my review. I had no idea who the killer was until about 3/4ths of the way into the book. Even then, it wasn't anything specific, I just had a strong suspicion that that person had done it. There were a number of funny Eddie moments in the book. I especially liked what he did t Check out my other reviews, discussions and link ups at Fantasy of the Silver Dragon. There were a number of funny Eddie moments in the book. I especially liked what he did to one of the Library Director candidates! I also really liked Dana. I hope we get to see more of that character in future books. I also liked getting to see the antics her fellow library workers got up to, and the worries that getting a new Library Director brought. There were also a few sweet and funny moments between Minnie and her Aunt, and Minnie and Ash. There was a lot of small-town gossip in the book. It was interesting how Minnie got some clues from it, and I also liked that it helped flesh out the characters and backgrounds of some of the characters. This was a quick read, in that once I started reading it I wanted to know what would happen next. It was easy to get sucked in, and there weren't any real slow spots. There wasn't action on every page, but everything that happened fit well. If you like cozy mysteries with cats in them, you need to try this series. I received this book as a gift for a review on this site. I can't tell you enough how much I enjoyed this book. The characters are likable and fun. Minnie Hamilton and her bookmobile Cat Eddie, are great together. All Eddie says is Mrr. but that does stop Minnie from talking to him all the time and asking him questions that she knows he will not answer with anything but "Mrr"
Minnie is dating a cop, Ash Wolverson who gets involved in the murder of the lady that Minnie finds in her library on a Sa I received this book as a gift for a review on this site. Minnie is dating a cop, Ash Wolverson who gets involved in the murder of the lady that Minnie finds in her library on a Saturday morning. Minnie is the Assistant Director at the town library. When Minnie and Eddie decide that the police are not working fast enough, Minnie gets involved more and decides to look into the death deeper than she needs too. She discovers that there is a book involved and she looks it up on the internet and finds out that the book is worth a lot of money. She helps the cops so much that the murderer is found and she and Eddie were there, but got away. This was the first book I have read in the Bookmobile Cat Mysteries and I thoroughly enjoyed it! Minnie, Assistant Director for the Chilson Library, finds a dead body and along with her cat Eddie, they discover clues to help solve the mystery. I loved Eddie the Cat and the cast of characters in this little town, made me wish it was real so I could move there! If you love cats, books and an easy clean read this book is for you. I did not know who did it till the end. I really like this book! Love Eddie(the cat)and most of the characters can't wait to read more. 2 things I didn't enjoy a little bit drawn out for me some points repeated to much, apply apply apply, and the distraction factor. And other thing was next book not out for a year this makes me sad. This is the 5th book but it can be read on its own. I have never read any others or this author befo If you love cats, books and an easy clean read this book is for you. I have never read any others or this author before but will be soon! just as good as the rest of the series. I absolutely love the Bookmobile Cat Mystery series. :) Minnie Hamilton, librarian extraordinaire, and her kitty sidekick, Eddie make me smile. Minnie is independent, intelligent, a bit feisty, but still sweet. The side characters are interesting and more than a little small-town quirky. It makes for a funny and entertaining cozy mystery series. Cat With a Clue is the fifth book in the series. It isn't necessary to read them in order. A reader could jump in with this book and still enjoy the sto I absolutely love the Bookmobile Cat Mystery series. :) Minnie Hamilton, librarian extraordinaire, and her kitty sidekick, Eddie make me smile. Minnie is independent, intelligent, a bit feisty, but still sweet. The side characters are interesting and more than a little small-town quirky. It makes for a funny and entertaining cozy mystery series. Cat With a Clue is the fifth book in the series. It isn't necessary to read them in order. A reader could jump in with this book and still enjoy the story. To fully know the background of all the characters, it's best to start at the beginning of the series but Cat With a Clue doesn't really depend on any monumental occurrences in previous books for its plot. The basics: Minnie comes into work one morning to shelve books. While she's puttering around inside the library, she nearly trips over a dead body. The woman is lying on the floor with a knife sticking out of her chest. Andrea Vennard had recently come to town to attend the funeral of her great aunt. But how did she get into the library before it opened? And who killed her? Before the police really even get started on their investigation into the murder, a baffling string of break-ins begin around town. Even the bookmobile is broken into. The common denominator is books. Minnie wonders if the murder and the break-ins are related somehow, but isn't sure what the murderer might be looking for. Can she and Eddie solve the case before someone else gets hurt or killed? Since this is my favorite cozy series, I knew I was going to enjoy this book before I even read the first page. :) The mystery was engaging and there were plenty of suspects and surprises. I always enjoy the side plot of Minnie's aunt matchmaking for her summer boarders, and her aunt's lovelife with neighbor, Otto. All in all, this is another fun addition to the series! This review has been hidden because it contains spoilers. To view it, click here. I can never get enough of Minnie and Eddie, books with cats in them are just fabulous and books where the main character is a librarian is also awesome! From the start, Minnie and Eddie have just made me grin and laugh a lot, although in saying that, there were times when I was equally nervous for them both! Especially in this book! Laurie Cass wastes no time getting to the murder, and this time, the victim is found dead in the library, which instantly made me fear for Minnie, I mean, if someone I can never get enough of Minnie and Eddie, books with cats in them are just fabulous and books where the main character is a librarian is also awesome! From the start, Minnie and Eddie have just made me grin and laugh a lot, although in saying that, there were times when I was equally nervous for them both! Especially in this book! Laurie Cass wastes no time getting to the murder, and this time, the victim is found dead in the library, which instantly made me fear for Minnie, I mean, if someone was killed in the library, maybe that means her life is at risk? I really had no idea what to expect from this one, but I loved it! Though I did knock off a star because I felt like I knew Minnie and Eddie well enough, and midway through this book, I felt like things were lagging, but once again by that last quarter things had me on edge again! I must admit though, mysteries aside, I’ve always been in it for Eddie and Minnie, I just love how Minnie banters with her cat so much, and Eddie replies in his mrr ways! I feel like human and feline are written so well, I’ve always been able to clearly visualize them both! I also love Kristen, Minnie’s best friend, and Minnie’s Aunt Frances! When I started this book I assumed that Eddie the cat was going to contribute to solving the mystery-- as in Wishbone or Chet and Bernie stories. I was disappointed to realize that Eddie was a regular (and in my opinion, annoying) cat. The beginning of Cat with a Clue is charming and the last pages are suddenly, abruptly, and unbelievably action-packed. But the majority of the book was terribly boring and felt like filler. It was a struggle for me to finish. Cat with a Clue is my first cozy myst When I started this book I assumed that Eddie the cat was going to contribute to solving the mystery-- as in Wishbone or Chet and Bernie stories. I was disappointed to realize that Eddie was a regular (and in my opinion, annoying) cat. Once I'd learned that the victim had lawyer, I figured this might have something to do with the estate. Great thing is that although less happened in the library, except for the murder, the case itself was a hunt for a rare book. I love this series. Eddie is such a realistic addition - he's pretty much a combination of the two cats who used to live in my house with me. In the audiobook, the narrator even manages to do a passable imitation of one of them. There's library politics, small-town history and murders, of course. Easily one of my favorite cozies. Minnie Hamilton is an assistant library director in the small town of Chilson. Her cat and confidante Eddie is the officially unofficial ambassador of the bookmobile that Minnie and Eddie drive through the county and in his downtime he is a typical cryptic feline out for his own gain. Life in this small town is quaint and typically nothing really This review is based on an ARC I received from NetGalley. It is an honest review and the advanced receipt of it in no way affected my review or rating. Minnie Hamilton is an assistant library director in the small town of Chilson. Her cat and confidante Eddie is the officially unofficial ambassador of the bookmobile that Minnie and Eddie drive through the county and in his downtime he is a typical cryptic feline out for his own gain. Life in this small town is quaint and typically nothing really happens there. It is full of well meaning neighbors and thanks to the gossip mill there are truly no secrets either. With typical small town life being…well typical, it comes as a shock to Minnie when she shows up early for work one day and find a murdered stranger in her library. Even more compounding is that there is truly no plausible explanation for the situation. The start of this book is wonderful. We are given just the right amount of details to build a charming town in our minds eye. I can just see myself taking a stroll in this picturesque town with its few blocks of a downtown, old brick buildings mixed in with the newer clapboard buildings painted in a variety of colors. I can see all the storefront owners opening up their shops for the day, advertising their wares. It is a very realistic setting. News of the murder creates a sense of unease with the local inhabitants. What is more confounding is that the victim is no stranger but a descendant of the local DeKeyser family who’s matriarch had just passed away. A murder in small town incites the local gossip mill with their theories of who done it and why. No one is taking this line of pondering more seriously than Minnie as it happened in her library and has potentially smirched the library’s reputation. If murder was not enough for her small town, there is now a rash of vandalism taking place throughout the town. It seems that there is more to this story than just foul play. Out to solve the mystery and put an end to the troubles afflicting Chilson Minnie starts tracking down leads. Interacting with many of the local inhabitants gives Minnie much to ponder and she is able to start putting together pieces of this puzzle. Which leads her straight into the arms of danger. In the end it is up to Minnie and her wits to stay alive and bring an end to this mystery. This was entertaining way to pass the time. In this story the supporting characters are reminiscent of what you find in a small town, and although you do not get to know them with a great degree of intimacy they are very enjoyable. I liked to quirkiness of Minnie, she is well developed and adds humor to the story with her companion and confidante Eddie. From early on I was able to surmise the ‘why’ of the mystery followed shortly after by the ‘who’ but the author does a good job of weaving in some red herrings in the background to make you hang on until the end to see if your assumptions were correct. I would recommend this book as a nice mystery for a beach read or when you are looking for a light and entertaining way to spend a few hours. Minnie arrives at work one morning, and as she is shelving book, stumbles onto a woman lying dead on the floor. Soon after, the library, the bookmobile and a local shop are vandalized. Is the murder connected to the vandalism? Minnie and Eddie find themselves once again looking for a killer. Somewhere between 3 and 4 stars, but I rounded up to 4 because of Eddie. Although enjoyable, it meandered a bit (ok, maybe more than a bit) in the middle. I think there was too many other things going on that distracted from the plot; the search for a new library director, Kristin's insecurities, her aunt's strange behavior, it was a bit too much packed into one book. I love that Minie is such a book nerd, it makes her more relatable to me than anything else. "I breathed deep, drawing my favorite smell into my lungs: books. Flowers were all well and good, but what could compare to the scent of stories, of knowledge, of learning, of history?" This is the 5th installment of A Bookmobile Cat Mystery by Laurie Cass. Early one morning assistant librarian Minnie Hamilton had come in early and was going about getting the library ready for the day when she discovers a dead body in library and the woman was stabbed with a box cutter. The woman that has been murdered was in town for a relatives funeral. No one can figure out how the victim got into the library because all the doors were locked.. A series of break-ins have occurred in Chilson This is the 5th installment of A Bookmobile Cat Mystery by Laurie Cass. Early one morning assistant librarian Minnie Hamilton had come in early and was going about getting the library ready for the day when she discovers a dead body in library and the woman was stabbed with a box cutter. The woman that has been murdered was in town for a relatives funeral. No one can figure out how the victim got into the library because all the doors were locked.. A series of break-ins have occurred in Chilson and no one knows the motive until Minnie finally figures out what the break-ins are about. The break-ins that are occurring are about a rare book on Wildflowers. Minnie then starts to narrow down her list of suspects. During this time her co-workers are pushing her to apply for the head librarian’s job, but Minnie drags her feet. Eddie the cat judges the people that are interviewing for the head librarian job, he showed his displeasure of one lady being interviewed by throwing up on her very expensive Italian shoes. Characters are well developed and the introduction of a very smart little girl named Dana who has been home bound do to many phobias that she has and will not allow her to go out into the world. I am hoping that Dana will be developed more and could possibly become a regular character. Very quick read, once I started I could not put it down until I finished. I was given a copy of this book by the author in return for an honest and fair review. Cute series, who doesn't love cats and books. 3 stars... This book was ok, but I won't go out of my way to read more, But if I find another book by the a Cute series, who doesn't love cats and books.